Use our World Time Map software as your time zone calculator to discover the best time to call anywhere around the world. SpiritWorks Software's world time zone converter and map shows you the time difference between international worldwide time zones around the world! Your world time zone map software clearly shows you the time difference between major cities and countries in most worldwide time zones. ...... easy-to-use world time map. * Your world time zone map software clearly shows you the time difference between major cities and countries in most worldwide time zones. 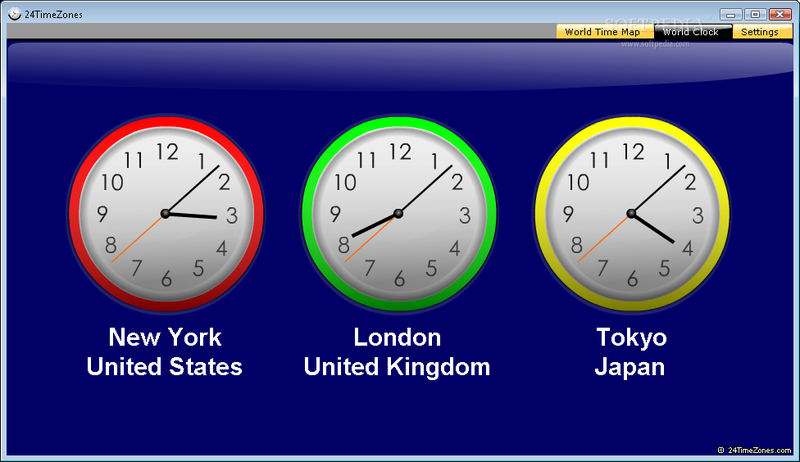 * Find out the time around the world, with your personal world clock and time zone converter. Versamap draws outline maps on 16 projections. Print maps; export as BMP, WMF. The easiest and most powerful cross-platform time tracking software available. Qweas is providing links to World Time Map for Windows 1.0 as a courtesy, and makes no representations regarding World Time Map for Windows or any other applications or any information related thereto. Any questions, complaints or claims regarding this application World Time Map for Windows 1.0 must be directed to the appropriate software vendor. You may click the publisher link of World Time Map for Windows on the top of this page to get more details about the vendor.